Find out the charges for each additional service; how they vary, and when you can purchase them. If you have any questions or need further information, contact us via our on-line chat or call our call center. Choose a First Row + Starpass seat to enjoy preferential check-in and boarding and the convenience of taking your baggage in the cabin. Up Front seats are those located in rows 1-5. These allow you to be among the first to exit after landing. Forward seats (rows 6-9) provide a smooth disembarking experience and the possibility to select an aisle or window seat. If you are looking for ample leg space to stretch, these are the seats for you. Emergency Seats are located in the row number 11 of the plane. You can select an aisle or window seat. Add your selection during your purchase. Important: Prices may vary due to time of purchase and route flown. The earlier you buy, the more you’ll save! *= Categoría de Seatings incluida (sin costo) en Tarifa Plus. Add the baggage you need to any of our fares! If you purchased the Zero fare you can add a carry-on from USD 12, which must meet the following dimensions: 25cm x 35cm x 55cm (13in x 9in x21in), including the handle, pockets, and wheels; and up to 20 kg. 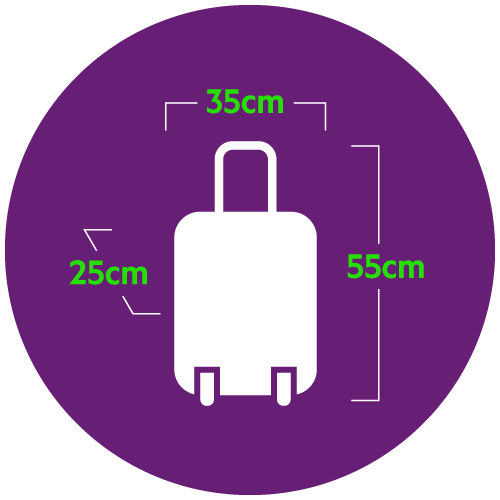 Each piece of carry-on baggage exceeding the dimensions described in the tables above must be carried as cargo. This service is restricted to 5 unaccompanied minors per domestic flight. This service is only available for children between 5 and 12 years minus a day. Charges are shown in the attached table. *Service charge in AIRPORT, applies to sales of tickets made in regional counter or sales offices in AIRPORT. Don't waste your ticket. Take advantage of our exchange service, which will allow you to change to an earlier or later flight, or to transfer your entire trip or leg to someone else. It consists in changing to a flight earlier than the scheduled, keeping the destination, and subject to the availability of seats in the earlier flight selected. It is only available in same-day flights or flights scheduled up to 2:00 a.m. of the next day. It can only be requested at the airport’s Sales Offices until closure of the flight selected. It consists in boarding a later flight - assigned by the airport staff - if the passenger misses the initial flight, keeping the destination. It can only be requested at the airport’s Sales Offices from closure of the flight up to two hours later. It allows you to transfer the ticket to other person. It can only be requested through our Contact Center by calling 600 600 2828 and 56 22 3525600, if you are calling from a cell phone, up to 48 hours before the flight. Applies for route changes, date and time. Subject to availability. Changes can be made up to 3 hours before your flight. At the time of making a change, all services will be incorporated into your new flight.